"That's a huge, huge role," she said. "That would be something that I would have to give my entire life to do because I would want to really pull it off," Rihanna said of playing Whitney Houston in a biopic about the late singer. 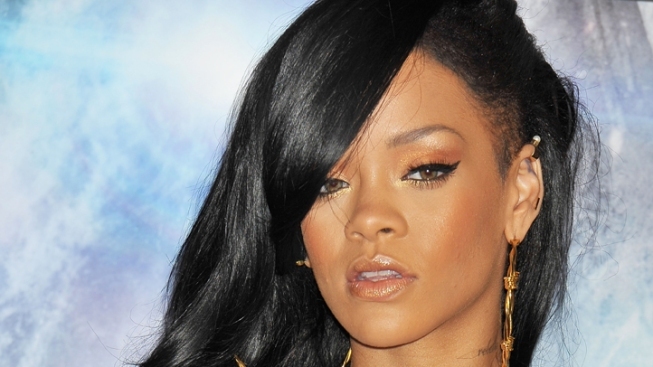 Rihanna has had a change of heart. Despite saying in March that she “hates” when “singers do singing movies,” the pop star said she would “love” the chance to play Whitney Houston in a biopic about the late legend. Rihanna told The Press Association that while she isn’t officially in the running for the role yet, she would be honored to play the part. Singer and actress Jennifer Hudson is also on the shortlist to play Houston, who died on Feb. 11 at 48. "I didn't get that call yet," Rihanna said. "That would be something that I would have to give my entire life to do because I would want to really pull it off. That's a huge, huge role and whoever does it has to do a good job." Rihanna: Domestic Violence Collaboration With Eminem "Needed to Be Done"
Rihanna explains why she chose to collaborate with Eminem, but was she apprehensive to record a song about domestic violence due to her history with Chris Brown? Also, how did the crowd react when Eminem joined her onstage at her recent concert in LA? The "We Found Love" singer, who will make her acting debut this month in the sci-fi action flick “Battleship,” told The Press Association that Houston’s hit, “I Will Always Love You,” was the first song she fell in love with. “It was really inspiring and it made me develop a passion for music," she said. “So really, she's partly responsible for me being here in this industry."